BenQ, an internationally renowned provider of visual display solutions, today announced the availability of its HT8060 and HT9060 CinePro 4K UHD HDR home cinema projectors. Leveraging BenQ's CinematicColor technology and the latest DLP chipset, the new engines are the industry's first sub-$10K installation projectors to deliver true 4K high dynamic range (HDR) with authentic cinematic reproduction that makes viewers feel as if they've been transported to the cinema. "From start to finish, film producers and directors are invested in creating a beautiful and rich movie. Until now, golden-eye cinema enthusiasts couldn't truly get that same experience in their home theaters without a hefty price tag," said Bob Wudeck, senior director, business, education, and CinePro solutions at BenQ America Corp. "The CinePro Series breaks the mold by using the same cinematic technology and color space to recreate that awe-inspiring, true-to-life effect. These projectors are the industry's first to bring together the best DLP 4K UHD chipset, DCI-P3 color-space accuracy and HDR support that's unlike anything else available for under $10K." The CinePro Series HT8060 and HT9060 4K UHD HDR projectors were designed to recreate the cinema experience at home, starting with the latest DLP chipset that's used in almost every digital and IMAX theater. This chip eliminates pixel shifting and blending, producing 8.3 million distinct pixels for true 4K UHD performance. Furthering color and contrast quality, the THX-Certified HT8060 utilizes BenQ's CinematicColor and Rec.709, assuring 100% coverage of the industry-acknowledged color gamut. BenQ provides a factory calibration report to ensure the projector was tested and adjusted for precise D65 color temperature, gamma, black level, white level, neutral gray, RGBCMY color tracking, hue, saturation, brightness and output from different interfaces based on ITU-R Rec. 709. The HT9060 combines CinematicColor with the Philips ColorSpark HLD LED system to reach the American film industry's super-wide DCI-P3 color space, covering a far greater visible spectrum than Rec. 709 and delivering three times the light output of current LED technology. As a result, viewers never have to hassle with lamp replacements that can lose brightness over time and can enjoy phenomenal picture quality for years to come, even in highly lit environments. In addition, a proprietary, 14-element, six-group and 4K-optimized lens that was built from the ground up pulls the image from the chip while preserving even the subtlest details in perfect clarity — keeping the original brightness while minimizing chromatic aberration. The pristine CinePro 4K UHD Series takes on unprecedented levels of depth, clarity and realism with HDR10 support. The projector-optimized HDR took BenQ over a year to develop and perfect. Based on BenQ's black equalizer technology found in the company's industry-leading gaming monitors, the projectors' HDR is tailored to perfectly balanced color saturation and rich color scale, revealing the details lost in dark areas without losing clarity or displaying incorrect greyscales. In addition, auto color and accurate tone mapping offer greater brightness and contrast, so every detail conceived in the director's mind but originally hidden is revealed in every scene. Both projectors are compatible with the optional Panamorph Paladin anamorphic lens, which delivers the immersive 2.4:1 aspect ratio of commercial cinemas without letterboxing, delivering 2 million more pixels for increased brightness and detail to recreate the full cinema experience right at home. BenQ's CinePro Series projectors were engineered to offer unique features that will make them a sought-after addition to high-end home cinemas. Integrators can quickly and easily install and configure the projectors with flexible adjustment tools, including horizontal and vertical lens shift. By incorporating the Imaging Science Foundation's (ISF) highly reputed ISFccc Certified Visual Calibration, the image and color performance of these projectors can be customized for any space, along with preset light balance modes for day and night. The projectors' 1.5X big zoom provides perfect imaging from a wide range of throw distances and mounting and placement options. With front-facing ventilation, they're ideal for a subtle ceiling-mount or concealing within a cabinet or wall inset, while the sleek modern design makes them blend into any space. They're compatible with most ceiling mounts, allowing installers to switch out old technology quickly as homeowners look to upgrade their viewing experience. Finally, the video and power signal ports are separated to accommodate thick cables and HDMI/power cable locks, ensuring effortless connection while preventing system failure related to unintended disconnection. BenQ's CinePro Series 4K UHD HDR home cinema projectors are now available for $7,999 (HT8060) and $8,999 (HT9060) at BenQDirect and authorized resellers including ADI, Projector Superstore, Projector People and SnapAV. 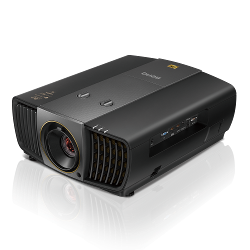 More information on the BenQ CinePro Series is available athttps://www.benq.com/en-us/projector/cinepro-pro-cinema.html. Well, I've always been attracted by the world of pleasures that we can get from good hi-fi systems and more recently by good home theatre equipments. I was only 20 years old (23 years ago) when I bought a pair of Kef 105.4 reference series loudspeakers at $2,000. At that time, I earned only $6,000 a year, and my mother thought I was really crazy to spend so much money. But I have never regretted it and it is the same for all I have bought since then (over $25,000...). More recently, I have discovered your Web Site on the net, and I must tell you that I was very impressed by this incredible DVD search engine. It was not long before I subscribed to your magazine. I have sent your Web Site address to many friends who share my love for home theatre. I'm happy to tell you that they are also very enthusiastic about it. There is nothing that comes close to it. I’m also impressed by the quality of the reviews; in particular the very detailed commentary about sound and picture. I store on my Pocket PC the Picture, DD, DTS and critics rating for all my DVDs (close to 300...). Now, I'm hooked on your magazine (as well as the Web Site), and I can say that I read from cover to cover. I was also impressed with the way you push forward HDTV and in particular, D-VHS. I MUST TELL YOU THAT WE NEED YOU AS MUCH AS YOU NEED US... I appreciate that you are not just doing your job. I can tell that you are really passionate about it, as I am. In fact, if I lived near you, I would love to be part of your team. So, if I had to summarize my thought about why I read Widescreen Review, I would say first that with your magazine and Web Site, I'm much better informed, so I can make smarter equipment and software purchases for my hard-earned money and second but not least, I feel that I am in a modest way, helping you do the work that is important to push forward (faster and better) the wonderful world of home theatre. Keep up the good work. I am a fan from Longueuil (near Montreal.